I was so super excited to get my hands on a copy of Sea of Shadows by Kelley Armstrong! Kelley’s Darkest Powers trilogy is one the first series of books that I read when I first started reading young adult books, and I’ve been hooked ever since! Sea of Shadows is a going to be a wonderful addition to my book collection! The story revolves around two twin sisters, Moria and Ashyn. These two sisters were chosen by the spirits to be the Keeper and the Seeker, given the task of freeing the souls of the damned. But this year things start to go wrong, and people start mysteriously dying. Traveling on a difficult journey, these girls must not only keep themselves alive, but they must save their world as well. Moria and Ashyn were really interesting characters. They may look alike, but that’s where the resemblance ends. Each girl has her own personality. Moria is strong and brave, whereas Ashyn is more reserved and quiet. These differences are what make these characters so special, and so different. Reading the story from each girl’s viewpoint was great, I really felt that I got to know each of them so much better because of this, and got to learn more of the story as well. There were quite a few secondary characters involved as well, but only a few that we can really get invested in. Roman and Gavril are two characters, who also end up becoming the love interests to the girls. These boys help the girls on their dangerous journey, and fight alongside them to keep them safe. The world building for this book is like nothing I’ve read before. Seriously, like, ever. There was rarely ever a dull moment in this book. Something was always happening or something always seemed to be attacking these poor girls. This just goes to show how insanely dangerous this world was, and also showed that the only people that the girls could trust were each other. Oh, and Armstrong does not hold back on the gory details. There is some seriously creepy stuff involved in this book. 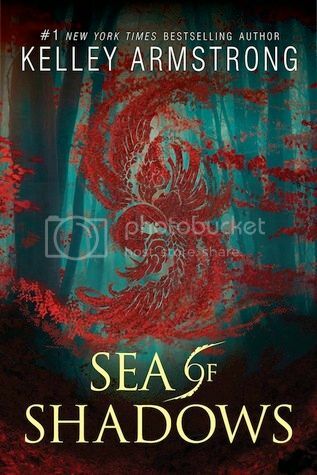 Overall, if you want to read something that is different from the norm, and seriously addictive, you’re definitely going to want to check out Sea of Shadows. I can’t wait to get my hands on the next book, because after the end of this book, there HAS to be a next book! I can’t wait to get my hands on it. YES!!!! I am so happy that you loved it! I've been anticipating this read and even shared in on one of my Waiting on Wednesday posts!! Seeing your review just makes me even more excited to read it! Thanks for sharing Christy!! Oh great review! Cannot wait to read this one either! Took Netgalley over 3 months to reject my request and it kind of bugged me that it took that long. But oh well! At least it's nearly out! Glad to hear it was an amazing read! And again, great review! !